It is often hard to help a child deal with there grief after losing a parent or friend to suicide. Generally it is recommended that you seek professional counseling for children to help them work through their grief after a suicide. The following is a collection of books for a parent or caregiver to help a child or teen deal with their grief following the suicide of a loved one. Please also visit our other pages that provide information about How to Find a Counselor After a Suicide and where you can find Grief Support Groups for Children or Families following a suicide. But I Didn t Say Goodbye is a book seen through the eyes of Alex, an eleven-year-old boy, whose father has died by suicide. This story is a glimpse into a child s traumatic and life changing personal experience. But I Didn t Say Goodbye introduces you to a bereaved family immediately after a suicide and ends five years later. The dialogue in each chapter will show you how you can help develop honest, open communication between children and the people in their lives. Alex s questions are the same as many other children following a suicide. Chapter 1, The Worst Day, focuses on the difficulty and emotional strain involved in telling children that someone they loved has died by suicide. Chapter 2, The Next Day, identifies the concerns children may think about and share as they search for answers as to why someone died by suicide. Chapter 3, Talking About the Funeral, illustrates the process of explaining funeral ceremonies and burial procedures to children. Chapter 4, Telling a Friend What Happened, explores the importance of sharing one s story for the first time. You will compare the bereavement experience of a five-year-old child, an eleven-year-old adolescent and fourteen-year-old teenager. Chapter 5, A Mourning Ritual, focuses on healing rituals adults can share with bereaved children. Chapter 6, Grandma s Special Gift, shows the significance of giving bereaved children special objects that once belonged to the deceased. You will identify how objects, individuals, and locations are capable of making children feel safe. Chapter 7, When Grief Hurts, takes a look at the grief response in children after a suicide. You will list ways to explain the grief process to children to help them cope with their painful feelings. Chapter 8, Catching Up with Coach, focuses on caring adults recognizing fears in grieving children and explaining ways to cope with those fears. Chapter 9, One Month Later, describes issues related to blame. Chapter 10, Six Months Later, identifies the benefit of bereavement counseling. Chapter 11, One Year Anniversary, reviews the lessons that have helped shape a child s experience a year after the suicide. Chapter 12, Five Years Later, illustrates ways to cope with triggers and continue the bond with the deceased five years after the suicide. In the last thirty years, the suicide rate among young people has tripled. In this book addressed to the young survivors of this epidemic, Earl A. Grollman, the internationally known lecturer, writer, and grief counselor, and Max Malikow, a psychotherapist and pastoral counselor, offer solace and guidance to adolescents who are confronted with someone of their own age who is contemplating or has committed suicide. 'Red Chocolate Elephants' is an activity book and DVD resource for children bereaved by suicide. In a world where children are often forgotten mourners, this unique combination of text, pictures, and voices - all in the words of bereaved children themselves - will be a treasured safe haven for young people to hear their fears, questions, and difficulties put into words by other children just like them. On the accompanying DVD, these same youngsters speak their words aloud as we see their drawings of their experience. The book and DVD are an excellent resource for parent and child to use together in trying to face the suicide of a loved one. This is also a valuable resource for those supporting children in schools and others therapeutic settings. A practical format for allowing children to understand the concept of death and develop coping skills for life. In this hands-on, interactive workbook, children who have been exposed to a suicide can learn from other grieving kids. The workbook includes drawing activities, puzzles, stories, advice from other kids and helpful suggestions for how to navigate the grief process after a suicide death. This newly revised edition of the book is designed for adult caregivers to read to surviving youngsters following a suicidal death. The story allows individuals an opportunity to recognize normal grieving symptoms and to identify various interventions to promote healthy ways of coping with the death of a special person. Although the language used in the book is simplistic enough to be read along with children and ultimately stimulating family discussion, it can be beneficial to all who have been tragically devastated by suicide. It is recommended for this book to be utilized in conjunction with therapy. The premature death of a parent can be devastating for young children- with the consequences far more profound when the parent dies by suicide. Amidst the resulting grief, turmoil and confusion, the surviving parent is faced with the monumental task of tending to the emotional lives of the children left behind. In this instructive and impassioned work, longtime children's bereavement counselor and psychotherapist Margo Requarth, M.A., M.F.T., charts the complex emotional waters every family must navigate in the wake of a previously unimaginable suicide death. Starting with the haunting tale of her own mother's suicide, Requarth weaves together her experience counseling "survivors," poignant interviews with children, teens and parents, and the latest research on suicide and its aftermath. What emerges is a groundbreaking "how-to" guide for parent survivors: how to manage both the immediate and long-term implications of the suicide, how to talk to your children, how to see them through the heart-rending anguish to a place of acceptance, healing, and finally, a renewed and deepened capacity for joy. Where Are You: A Child's Book About Loss is a kind and supportive text with beautiful illustrations designed to help children of all ages cope with the loss of a loved one. It is created with love and care so that even the youngest readers will find comfort during this stressful and difficult time. Fire In My Heart, Ice In My Veins A Journal for Teenagers by Enid Traisman. Teens can write letters, copy down meaningful lyrics, write songs and poems, tell the person who died what they want them to know, finish business and use their creativity to work through the grieving process. With sensitivity and insight, this series offers suggestions for healing activities that can help survivors learn to express their grief and mourn naturally. Acknowledging that death is a painful, ongoing part of life, they explain how people need to slow down, turn inward, embrace their feelings of loss, and seek and accept support when a loved one dies. Each book, geared for mourning adults, teens, or children, provides ideas and action-oriented tips that teach the basic principles of grief and healing. These ideas and activities are aimed at reducing the confusion, anxiety, and huge personal void so that the living can begin their lives again. Included in the books for teens and kids are age-appropriate activities that teach younger people that their thoughts are not only normal but necessary. In light of how difficult it is just to survive the teenage years, the grieving process can be especially difficult and overwhelming for teenagers. This diary affirms the grieving teen's journey and offers gentle, healing guidance. In order to sort through their confusing feelings and thoughts, teens are prompted to explore simple, open-ended questions. Teens are encouraged to write what they miss about the person who died, the specific feelings that have been most difficult since the death, or the things they wish they had said to the person before they died. How do you parent a child or adolescent whose loved one or friend has died? How can you understand what to expect, what to say, and what to do? 10 Steps is a sensitive, to-the-point guidebook that uses a combination of empathetic descriptions, clear explanations, illustrative stories, and practical suggestions to aid you on your journey. It includes special sections for parenting children grieving the loss of a brother or sister, loss from suicide, multiple losses, and loss of someone killed by another person, as well as a short section on trauma. With your help, the children you love can continue their growth, telling a story of their lives that includes nourishing memories and a sense of themselves as strong, resilient, caring people. The perfect resource for parents, grandparents, loving relatives, and caring adult friends--and also for teachers, counselors, and other professionals helping children and parents with loss and grief. Author: Marilyn E. Gootman Ed.D. The advice is gentle, non-preachy, and compassionate; the author has seen her own children suffer from the death of a friend, and she knows what teens go through. The revised edition includes new quotes from teens, new resources, and new insights into losing a friend through violence. Also recommended for parents and teachers of teens who have experienced a painful loss. Foreword by R.E.M. singer/songwriter Michael Stipe. Author: Alan D. Wolfelt, PhD. 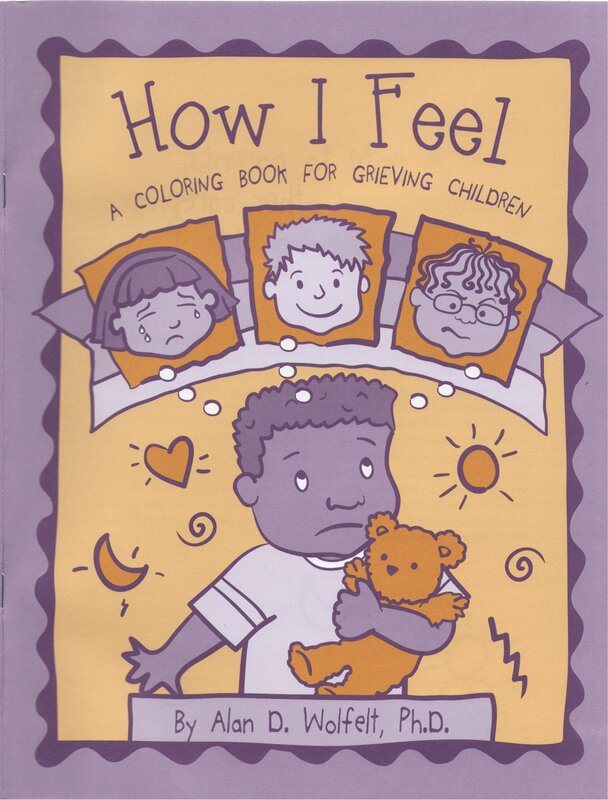 Dr. Wolfelt’s coloring book for kids ages 3-8 explores many of the feelings grieving children often experience. The expressive, easy-to-color drawings clearly depict disbelief, fear, anger, loneliness, happiness, sadness, and other normal grief feelings. And the simple text accompanying the drawings (“Someone I love has died”; “Ever since this person died, I have felt new and scary feelings. Grown-ups call these feelings grief”; “Sometimes I feel all alone”; “Sometimes I hurt inside”) provides grieving children with words to describe their new, sometimes scary feelings.